(1.) 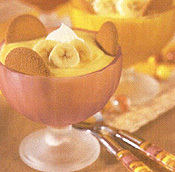 Combine milk and pudding mix in bowl. (2.) Mix well Sour cream and cool whip together. (3.) Combine mixture to pudding mix. (4.) Layer 1/2 of bananas and wafers in dish. (5. )Add 1/2 of pudding mix. (6.) Repeat steps 4 and 5.